Trevor Pateman's Philately Blog: A Postmaster Provisional in a Dealer's Box! Some of my readers will know that at stamp shows I often have boxes where every item is priced the same (Einfachpreis, Prix Unique). It cuts down my work in preparing material for sale and it makes the mental arithmetic of selling easy. 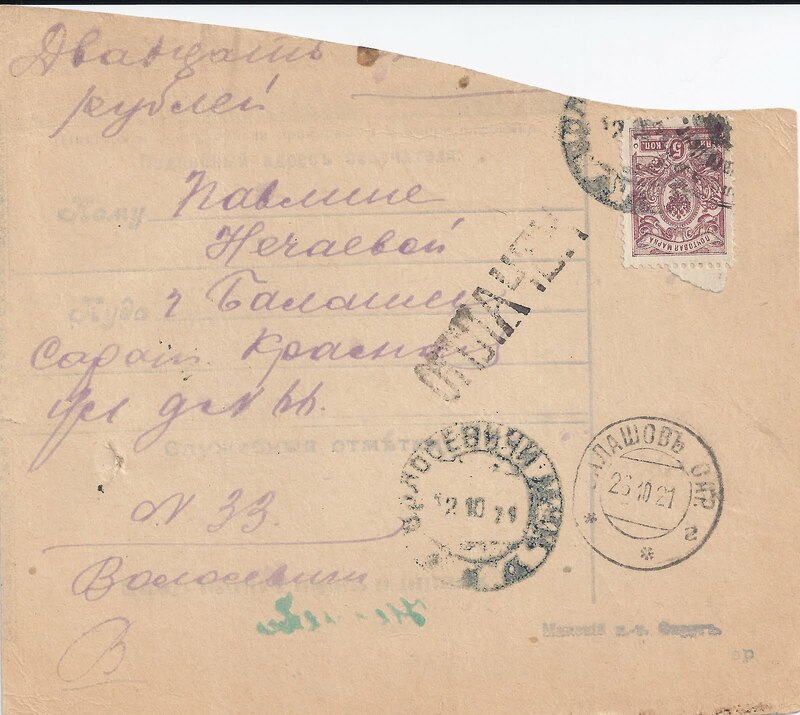 Lot 3477 in the current Cherrystone sale is a complete Money Transfer Form sent from the same office in the same handwriting to the same destination on the same day and for the same amount (20 000 roubles). The Cherrystone item is numbered 36 (bottom left); mine is numbered 33. The Cherrystone item is franked two 5 kopeck perforated stamps with the 1921 Minsk Postmaster Provisional Control overprint, which revalues them to 250 roubles each (Michel 3a, catalogued at 120€ each). I looked at my fragment. Sure enough the 5 kopeck stamp has the Control overprint, top right of the stamp. I had missed it, probably seeing just a smudged cancellation. The top half of the MTF which has been cut off almost certainly had another copy of this 5 kopeck stamp. The moral of this story? It pays to look through Dealers' Boxes, even your own!